Any list of top wines is arbitrary, just by the nature of individual tastes, if nothing else. But we all love lists, don’t we? We especially love lists when we can try the wines that land at or near the top. I even enjoy drinking wines from the same winery, but a different vintage than the award-winner. That’s the case with this week’s wine. Beringer’s 1994 Chardonnay became the first white wine to top Wine Spectator’s Top 100 in 1996. So why should you care about that, more than 20 years after the fact? Most quality wineries don’t change their formula much from year to year. Sure, there are yearly differences based on weather and availability of grapes. But for the most part if you like a particular wine, odds are good you will like that same wine from the next vintage. So a wine could have the same quality, but if there wasn’t as much excitement about the wine, or if Spectator simply chose not to review it, it would not make the Top 100. Getting a wine on the Top 100 list, which Beringer has done several times, is a good indicator that winery knows what it is doing. 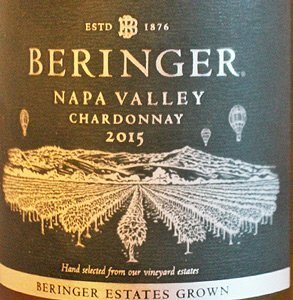 If you take a sip of this chardonnay, there is no doubt the folks at Beringer know what they are doing. For a wine at this price, it is surprisingly rich and creamy. It is a beautiful pale gold color in the glass with pleasant citrus aromas. That is followed by tastes of pear, apple and lemon on the palate. The ripe fruit is balanced by a crisp acidity. It is a complex, elegant wine, equally fine as an aperitif or with a gourmet meal. The grapes come from several vineyards in southern Napa Valley, where the cooling fog from the San Pablo Bay covers the vineyards most afternoons. This allows the grapes to slowly mature on the vines, developing richer, more complex flavors. The grapes were harvested late at night and early in the morning during the coolest part of the day. After gentle pressing, 25 percent of the wine was fermented in stainless steel with the rest in French oak (20 percent new) for six months. About 80 percent of the wine then went through secondary malolactic fermentation to produce a creamy mouthfeel with a solid acid backbone. It is a nice balance for people who want the lush, creamy taste but still want the fresh taste you get from fermentation in stainless steel. 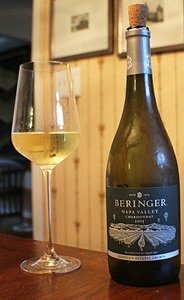 Beringer offers a Private Reserve Chardonnay that sells for twice this price, but unless you are trying to impress someone, or you have a particularly sensitive palate, this wine will be all you need. Winery: Beringer Vineyards is packed with history, and the owners have circled back to connect with their roots. The oldest continuously operating winery in Napa Valley, the winery got its start when Jacob Beringer left his home in Mainz, Germany for New York in 1868. The stories he heard about Napa Valley convinced him the countryside would be like his native land, so he headed west. Jacob and his brother bought 215 acres in St. Helena in 1875. They made 18,000 cases of wine their first harvest. The family’s pioneering spirit continued throughout the 20th Century, making wines from all over the Napa Valley and venturing into other areas such as the Central Coast and Paso Robles. They even made sacramental wine during Prohibition to keep the winery open. If you have been to Napa Valley you certainly have seen their historic Rhine House, built to resemble a gothic Rhine castle. The winery offers a variety of tastings there, in the Old Winery tasting room and on the porch. You also can tour the Rhine House and the Old Winery and tunnels. Beringer is a must-see on any visit to Napa. Beringer produces cabernet sauvignon, chardonnay, pinot noir, red blends, pinot grigio, merlot, sauvignon blanc, zinfandel and white zinfandel. Although the winery is owned by Treasury Wine Estates, history has come full circle. Jacob Beringer’s great, great grandson Mark Beringer is now the chief winemaker, ready to create some new traditions. 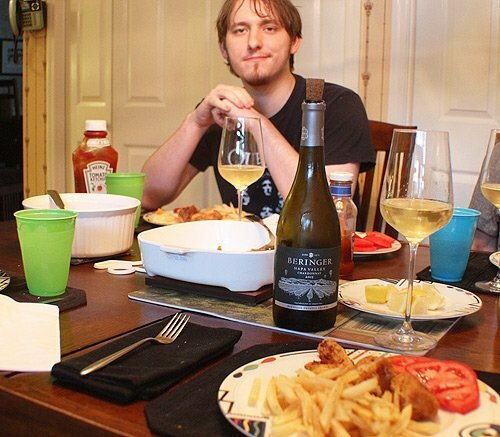 Michael enjoyed Beringer Chardonnay with dinner. Goes with: I picked up frozen cod and made fish and chips one night last week, and it was delicious. I used my deep frier for the french fires and pan fried the cod so I could get them done at about the same side. This is a dish I usually associate with beer, but it works really well with the right kind of white wine, such as the Beringer Chardonnay. Teri used malt vinegar on her fish and reported the wine worked really well with it. She said it was delicious. I used cocktail sauce and also thought the wine was a great match. The fruitiness of the wine balanced the sharp flavors from the sauces we used, and the crisp acidity was just what the fried fish needed. This elegant wine will pair well with all kinds of fish, chicken with cream sauce, chicken on the grill and a wide variety of cheeses. Chill it well and let it warm up in the glass for a few minutes before drinking it. It will be like drinking a little bit of history. To cook the cod simply cut in 2-4 inch pieces, coat with a breading and pan fry at medium-high temperature for 3-4 minutes per side. When I cook fries sometimes it is difficult to get them crisp. Here is a good recipe that keeps them crisp. Soak the potatoes for about 30 minutes. Dry before cooking. Heat the oil to 275 degrees. Cook the potatoes for 9-10 minutes until they are partially cooked but still pale. Remove from the oil and drain on paper towels. Allow to cool. Heat the oil to 350 degrees and return the potatoes to the oil. Cook for 3-4 minutes until golden brown. Remove from oil and drain on paper towels. 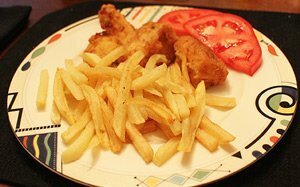 If the rest of the meal isn’t ready put the fries in an oven-proof serving bowl and warm in the oven at 250 degrees. This tends to make the potatoes even crisper. Salt and pepper to taste.